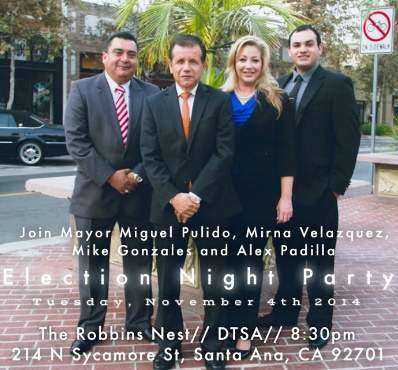 Santa Ana Mayor Miguel Pulido has provided considerable support to City Council challengers Mirna Velasquez, Alex Padilla and Mike Gonzalez. All of them will be at the Election Night Party tonight. If you have not voted yet please do so today. Polls will be open until 8 pm. Click here to find your polling place. Team Reyna is more of a nightmare than a dream. That is not a good picture of Miguel. This looks like his Dia De Los Muertos Crypt Keeper Photo. Any team led by John Palacio is doomed for failure as team Santa Ana is. Maybe John will remain in Arizona full time after he loses tonight and take la gorda Valerie with him. Without Palacio telling them what to do David and Roman will be more lost than ever and that’s saying something. God help us all if those two idiots remain on the council. Amezcua’s party is being held at Casa Lomeli in Villa Park. They are having a taco truck for her. The rest of the guests are just eating pizza.